This January, KaBOOM!, an award-winning imprint of publisher BOOM! 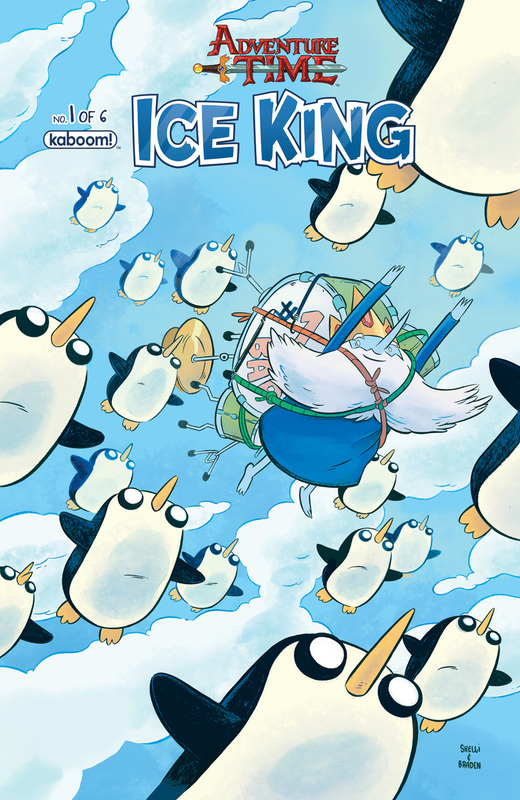 Studios, and Cartoon Network Enterprises, the licensing and merchandising arm of the network, are pleased to present the six-issue limited series Adventure Time: Ice King. 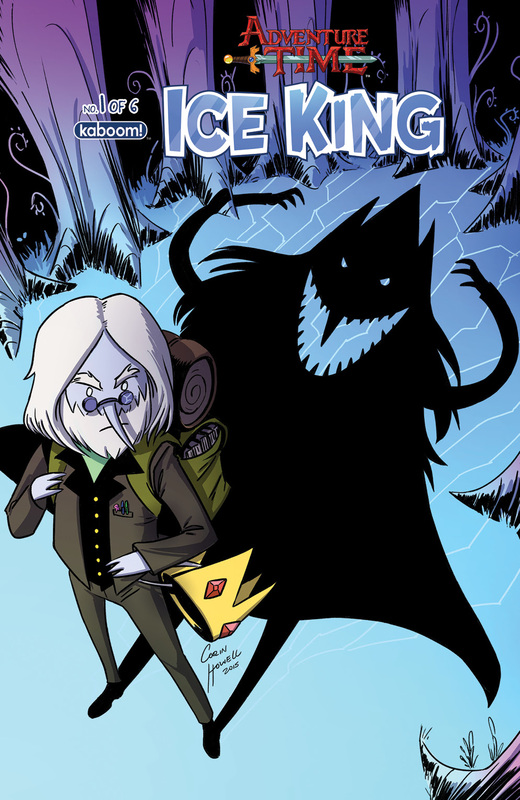 Storytellers Emily Partridge (Adventure Time) and Pranas Naujokaitis (Uncle Grandpa), along with artist Natalie Andrewson (Lumberjanes), focus on one of the most tragic and hilarious characters in the Land of Ooo in an exciting new adventure that really shows what makes the Ice King tick. The Ice King has always been there, kidnapping princesses, messing with Finn and Jake, and generally being a weirdo. But there’s way more to him than that! He’s a deep, thoughtful person with a heart full of love! Or…maybe he just really wants to marry a princess. Either way, this is one journey the citizens of Ooo aren’t likely to forget! Ice King wakes up one morning to find Gunter missing and a ransom note from someone called Dark Magister Templi Marble! 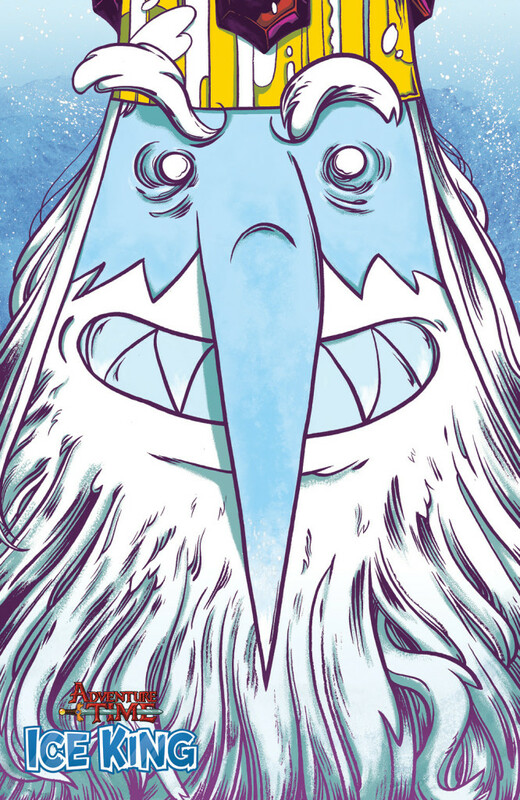 Panicking over his sweet Gunter, Ice King goes to Wizard City to find help and discovers the coolest, most intimidating secret society of wizards who are also looking for Marble. KaBOOM!’s award-winning Adventure Time comics are based on the hit Cartoon Network original series. From the mind of series creator Pendleton Ward and produced by Cartoon Network Studios, Adventure Time follows the unlikely heroes Finn and Jake, best buddies who traverse the mystical Land of Ooo and encounter its colorful inhabitants—and always find themselves in the middle of heart-pounding escapades. Adventure Time: Ice King #1 (of 6) arrives in comic shops on January 20th with a main cover by the original Adventure Time comic artists Shelli Paroline & Braden Lamb for the price of $3.99 under Diamond order code NOV151140. Also available in a limited quantity is a subscription variant by Corin Howell and a retailer incentive cover by Wyeth Yates. Final orders are due from retailers on December 28th, so let them know to pre-order you a copy if you want to be guaranteed one! Not sure where to find your nearest comic retailer? Use comicshoplocator.com or findacomicshop.com to help you out!